Christmas is supposed to be a tranquil and placid time. Good food, beautiful decoration and the people you love surrounding you. Peace and quiet and, at best, snow falling outside. But instead you have, all and foremost, one thing: Christmas Stress. This year, you will break the vicious cycle you have been spinning in year after year during Christmas time! Last minute shopping, dinner preparations, baking, and the prospect of seeing this one specific relative again you can not stand at all… All these things will not taint your festive spirit this year! We from Ambient-Mixer.com will help you to relax during the stressful times and save all your energy for the holidays. The first step into stress-free Christmas preparations is a step back. Close your eyes. Take a deep breath. And breathe out again. Repeat this for a minute or two. Now we can start. Just tune in one of these relaxing ambient noise mixes and tackle your chores and preparations much more relaxed and motivated! Do you miss summer already? It’s wet and cold outside, it’s getting dark so soon, and at some days you wonder if you will ever feel warm again. Bring summer back—at least acoustically. With the sound of waves washing against shore or a sailing ship, seagulls screaming in the blue sky, and a soft and warm summer wind you can recreate a summer feeling no matter where you are. At the bus, waiting in line at the grocery store, or curling up on your couch at home. Let these beach atmospheres relax you and reminiscent your last beach holiday. 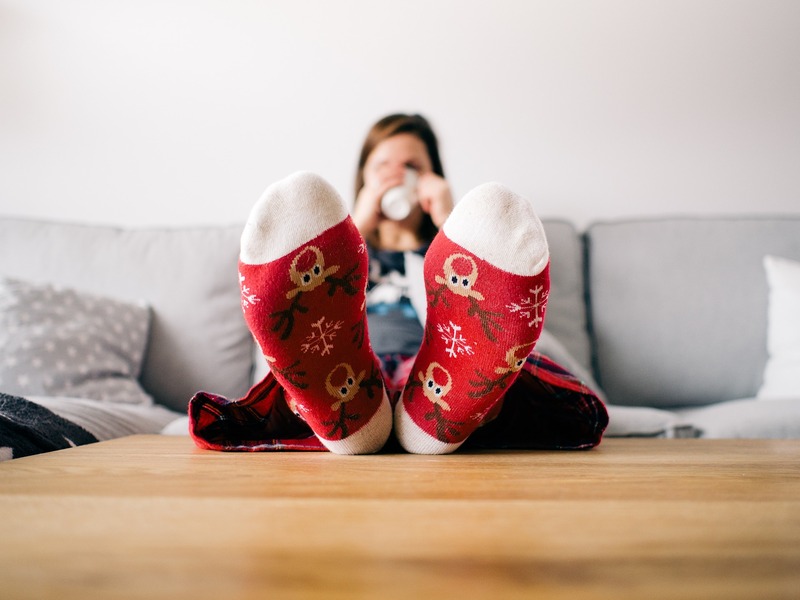 During the stressful Christmas preparations and the holidays themselves, you may hardly find the time to catch up with your favorite series, watch a movie, or read a book. That’s a real pity because fleeing into fictional worlds and for once worry about a characters problems instead of your own can take a lot of stress from you. But what’s stopping you from dreaming yourself into the fantastical worlds of your favorite pieces of fiction? Exactly, nothing! During shopping or while you are baking, tune up some soundscapes inspired by your favorite book or movie. E.g. Maybe you have been lucky enough to escape from all the holiday madness to a snowed-in cottage in the mountains or deep in the woods. Far away from stress and hectic, you spend your days at the crackling fire, listening to the winds outside. Or you can take a stroll through a beautiful winter wonderland in nature. If you are not one of the lucky few, you can still imitate the feel of a cabin in the woods or a nice walk through a winter forest. 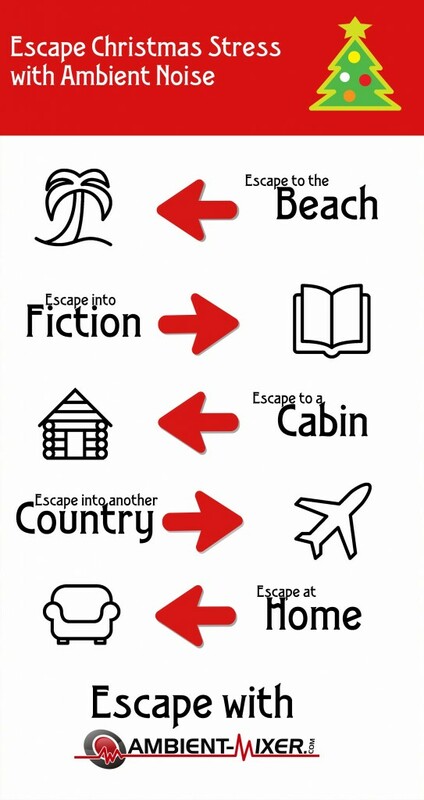 If a secluded cabin sounds too tame for your taste, maybe a mental escape into another country is the right thing for you. Dream yourself into a European city, an Asian village, or the deep nature of South America. On the other side… Why strive far when de-stressing can start at home! Brew yourself a hot cup of coffee, tea or a hot chocolate and take a few minutes for yourself. Put your feet up and tune up some relaxing music or other calming ambient sounds to mask the stress and noise from outside. And don’t forget to breathe!